Beardy - Little Moustache (Kamiscowesit) – was another important Cree leader of the second half of the nineteenth century. He was born near Duck Lake in 1828 and died on his own reserve in Saskatchewan on 16 April 1899. 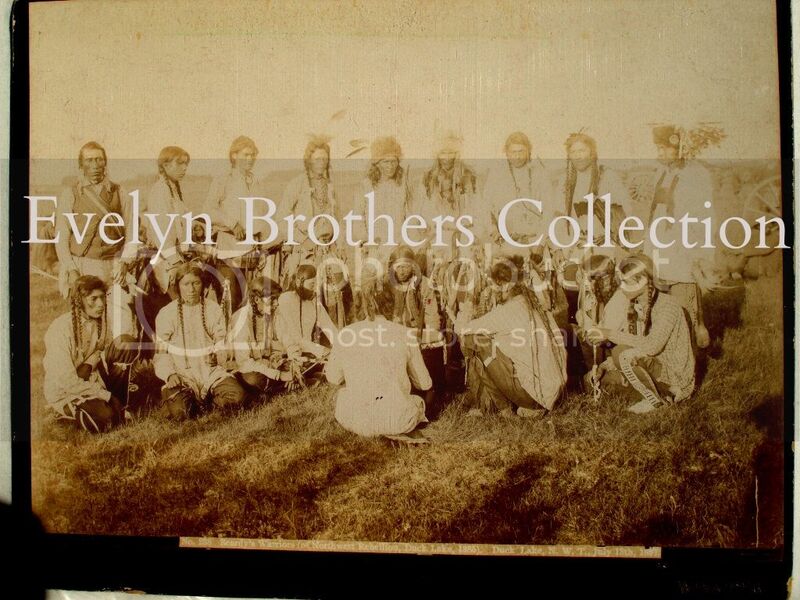 The Willow Cree band that he led were related to, or allied with, the mixed-blood descendants of George Sutherland, who had been an employee of the Hudson’s Bay Company at the end of the 18th century. He became chief of the Willow Band in 1870 and initially welcomed the idea of the Canadian govenrment treating with the Cree – possibly as a result of the samllpox epidemic that swept the Canadian prairies that year, killing possibly as many 12,000 people and doubtless due to the knowledge that the traditional ways were coming to an end with the depletion of the buffalo and the increase of settlers; however he refused to attend the first signing of Treaty Number Six in August 1876 because the comissioners wouldn’t allow him to meet in a location foretold to him by a vision. When he finally met with the comission at Duck Lake, he objected to the lack of provision the government had in mind for the future when the tribes could no longer rely on buffalo and other game. However, he saw no option but to sign for his people. Beardy chose an area adjacent to Duck Lake for his reserve, but when the promised agricultural equipment and animals didn’t arrive, he protested to the Lieutenant Governor of the North-West Territories, David Laird, in September 1877 and persisited in his attempts to alter the treaty so that his band would receive sufficient assistance to survive the looming crisis when they could no longer follow the traditional life. He backed this up with a letter to the governor general of Canada, Lord Dufferin, in January 1878 and became something of a thorn in the side of the treaty process. After complaining that his annuities were not brought to his reserve in 1878, officials went to see him but not with the goods he was expecting. He refused what they did bring and by December, his band were so destitute that he warned he would take what he needed from local merchants. The NWMP defused the situation by gving him treaty money to buy provisions but he kept up his protests when he didn’t receive everything the commissioners promised. To make matters worse, the government surveyed Beardy’s reserve and instead of allotting the band all the lands they wanted, it excluded those parcels claimed by the local Métis, quite probably trying to avoid any conflict with them, and forced the chief to accept the exclusions or face loss of treaty entitlement. Continued destitution in the early 1880s led to Beardy allegedly killing some treaty cattle intended for stock raising to feed his people. However, when Beardy complained to Governor General Lorne in 1881 and requested more help and immediate implementation of the treaty, it had no effect. Beardy and other Cree leaders, like Poundmaker, Big Bear, One Arrow and Little Pine met at his reserve in August 1884 to discuss the treaty and possible future action if grievances continued to be ignored, then Beardy, Little Pine, and Big Bear began organizing a meeting of all Plains Cree chiefs to be held in 1885. Indian involvement in the Riel Rebellion is said to have started at the Duck Lake where Superintendent Crozier of the NWMP was meeting with the Métis under Gabriel Dumont and his Indian allies on March 26, 1885. Assiyiwin, one of the Chief Beardy's headmen, was shot by Joe MacKay, a scout and interpreter. Allegedly, Assiyiwin reached out to shake hands with Superintendent Crozier and MacKay shot him, thinking he was going to seize Crozier’s gun (another version of these events can be found at www.dlric.org/indian_version_battle.html). This led to a more general breakout of shooting until Dumont suffered a head wound and Riel, himself, took over, and ordered the killing to stop, allowing the NWMP to retreat. Beardy refused to allow his people to join Riel in 1885, but men from One Arrow’s band and some of own his men, lured by promises of food and threatened with destruction by the Metis if they didn’t, did lend their services, as he explained to Major General Frederick Dobson Middleton at a meeting at Batoche that year. Because he had left the reserve during the Rebellion, against the orders of the government, the entire Willow Band were suspended from treaty and Beardy found himself no longer recognised by white officials as the leader – although his band continued to do so until his death in 1889. On back my photograph is a note from the original owner(? )"Almighty Voice seated third from left" the photograph is from a collection of 13 images owned by R.C.M.P. veterinarian Ernest Joseph Camies who served during the Northwest rebellion. Almighty Voice would have been a teenager in the photo, and just a kid during the rebellion (his father did participate). That being said there seems to be some possibility that he was photographed in the group, and the photograph's original owner Ernest Joseph Camies who was there a 120 years ago seems to have thought so too. Please be considerate that I am not trying to insinuate a fact just wanted to pass on what I thought was an interesting detail open to discussion.